These 5 huge skinner blend canes took me 2 hours to make. TIP: I don’t like “streaks” in my blends, so I make sure to blend them well and when I stretch the canes, take them to a #6 setting on my pasta machine and then roll them. This eliminates “streaking” and makes a subtle & refined skinner blend. A little fishy fin cane I made using the Zipper Cane Tutorial. A closeup of one of my fishy canes … not my favorite one, but this cane demonstrates the best how that little fin “fades” into the belly of the fish, leaving it with an almost translucent effect, like it’s hovering over the fish and not in the fish itself. Colorful balls of fresh clay ready for next time. One of the color palettes I made using this tutorial here. 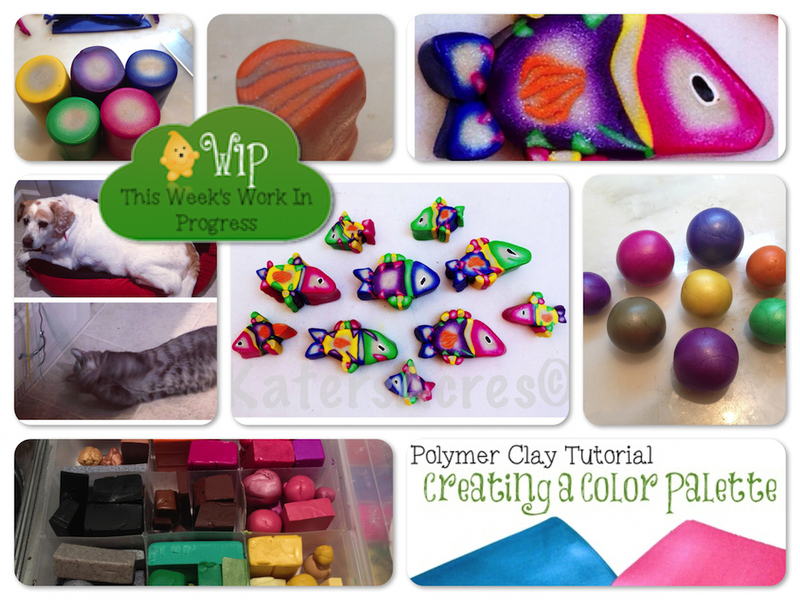 TIP: I use this method for all of my custom clay palettes. I never repeat a palette exactly, which is another one of the cool things about Parker & Lolly and their friends … because the colors are so highly customized, an exact duplication is not possible … especially since I don’t use color recipes. Showcasing a portion of my polymer clay box which contains “straight from the package colors” as well as some custom blends. This box hasn’t been this full in … well … ever. I’ve got a lot going on right now. These are my “kids” Daisy & Smokie. Notice how Smokie is viscously attacking the strings I tied on my drawer handles for her. Those strings are cheap entertainment for my kitty I tell you. She attacked those strings with vigor one day this week for over an hour. And last but not least, 8 hours (an entire clay day) of hard and tedious caning work in my studio. These millefiori fish canes, “fishies,” are so cool, they are getting their own post later this week! What’s going on in your studio? What are you working on? Working on a project and in need of some help or advice? Is there a project you’d like to see me tackle and feature on the blog? Let me know in the comments below. I love to hear your thoughts & ideas!